in the shops 23 Aug! Well with Dawn Flyer now completed and flying with just some details to write up it has been time to get the crayons out over the last few weeks and get started on the next design project. Its been a while since I did a biplane so this was top of my list but wanted to keep it relatively compact and something sport but with some scale like character drawing inspiration from a number of full size but keeping the build relatively straight forward. 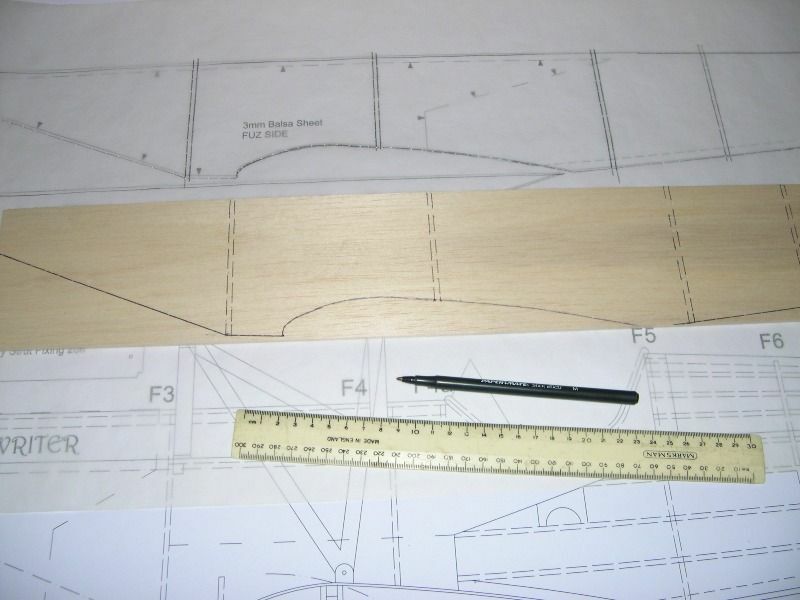 The end result is the drawing below for a 48" span model for a 300-400 watt system or equivalent i/c motor. 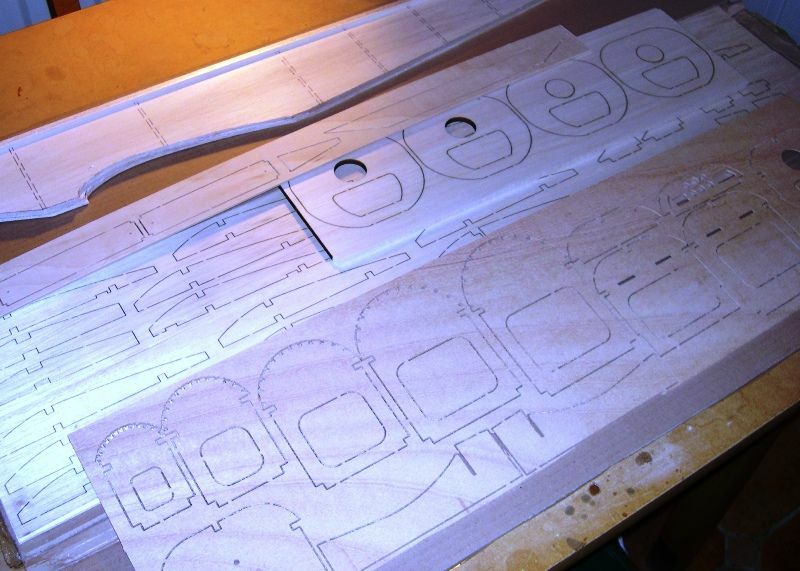 The drawings are now complete and ribs and formers ready to go away for laser cut parts to be produced. Always interesting at this stage to get some feedback so let me know what you think. I have a thing for biplanes. It would need a nice four stroke in it for me though. I have a thing for biplanes. I am building one currently- Galaxy Domino. And that will have a nice four stroke in it! Looks nice, good size too. Woooo that looks like a very nice biplane. .....Yummy.....Any one got a spare .25 4S radial? The proportions look spot on to my eye, although i'd be tempted to increase the tail span a tad for aesthetic reasons alone. I did think at first that the wheels were too far aft, but I think your CG position is actually too far forwards instead! Interesting Tim, I have already increased the span of the tail plane! I like to think of the CG being safe and I can tweak its position after flight tests, some months away at the moment. The jury is still out as to electric or i/c but will have to make a decision before long. I do have a spare OS 52FS tucked away and a couple of 400 watt brushless motors althought the cleanliness of electric is begining to swing in its favour. Lindsay, it has got to have a four stroke! 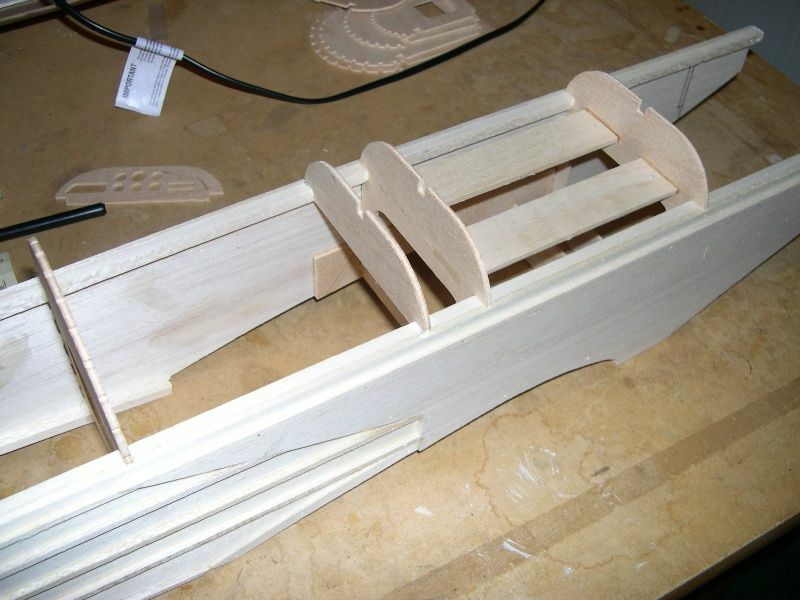 Please join me in building a 40 sized biplane with a four stroke up front, it will do it justice with the lovely sound! Just direct the exhaust away from the plane, simple! Well that's what I think anyway! I'm no expert when it comes to ic engines, but I'd have thought that a 52FS was more akin to 600-700 watts. Now if you were to give it a symmetrical wing section, then you'd have a killer aerobat! Well with Christmas out of the way I figured it was time to get cracking. 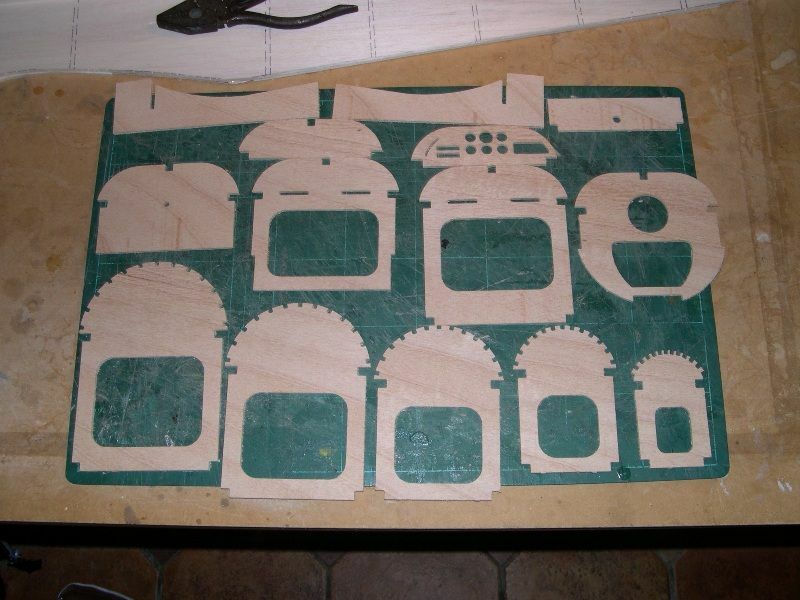 Stage one was actually ordering all the formers and ribs to be cnc laser cut by Slec, as usual a super job arrived this morning. 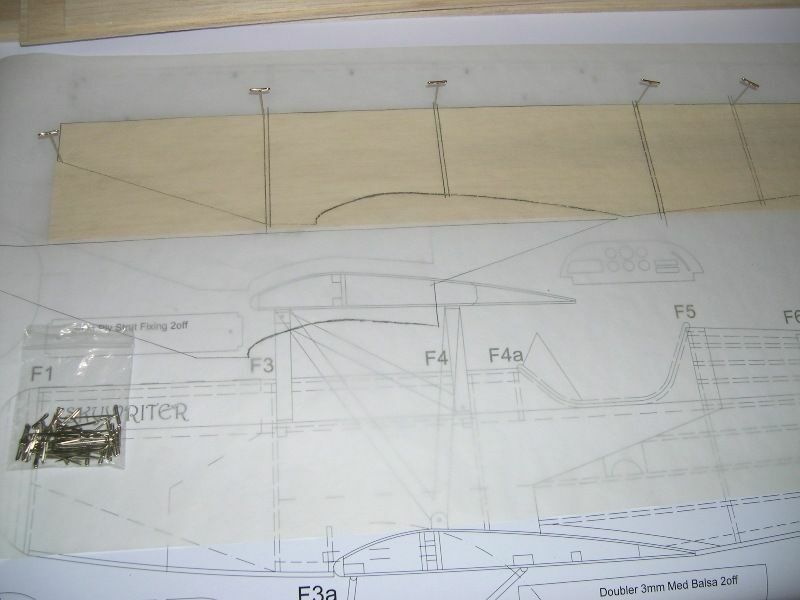 In preperation I had already made up the fuselage sides so to start I figured I would show how I transfer from plan to timber by tracing the part onto grease proof paper and then push pins through the paper into the wood and then join up the dots and cut out. 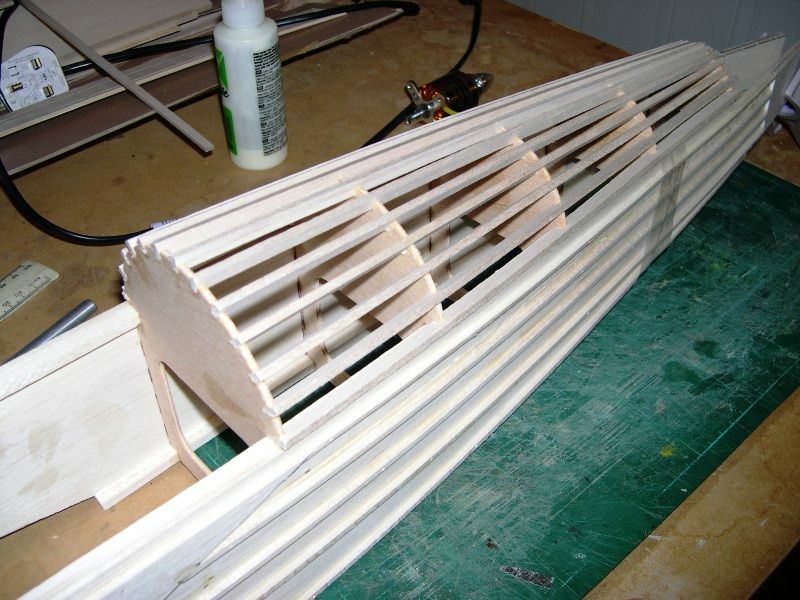 In this case the fuselage sides are made of 3mm medium balsa. I marked out the positions on all the formers as this assist greatly with alignment and keeping things square. 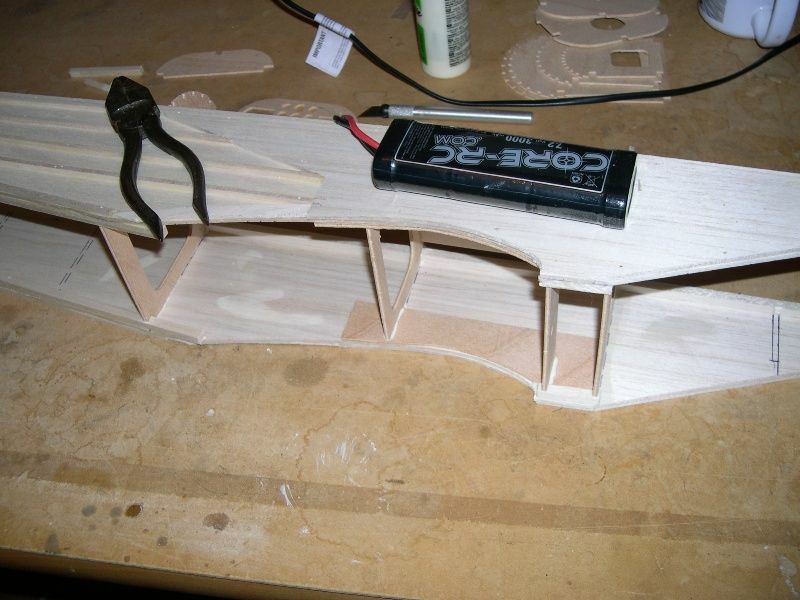 However we start by gluing the outside forward doubler again from 3mm medium balsa. 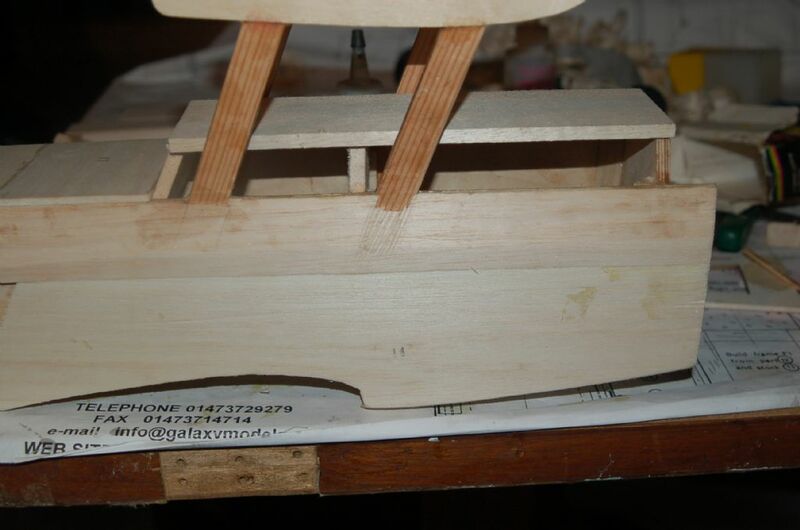 This is positioned square to the bottom of the fuselage leaving a 6mm offset at the top for the top fuselage sheeting later in the build to have a good contact area. 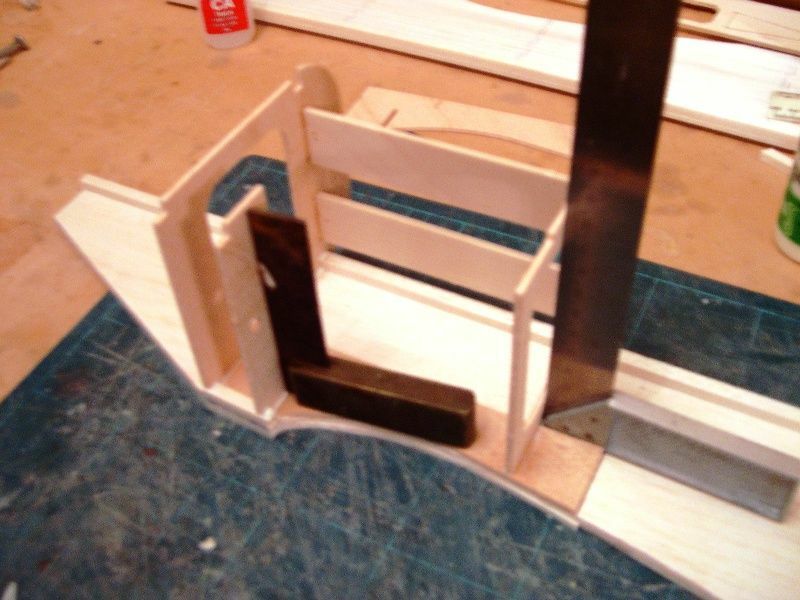 The external rear stringers are then glued in place, these being 3mmx3mm square and the tail doubler again from 3mm for added strength. 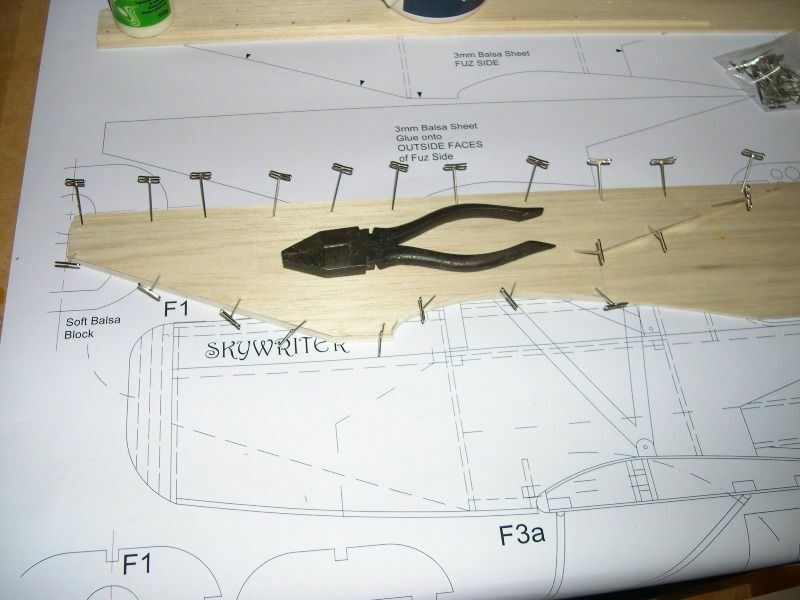 An additional 6mm wide strip of 3mm balsa sits around the wing seat, this adds strength and assists when covering with film later. Next job was to trim out and sand the formers - note I added a cockpit instrument panel for fun. 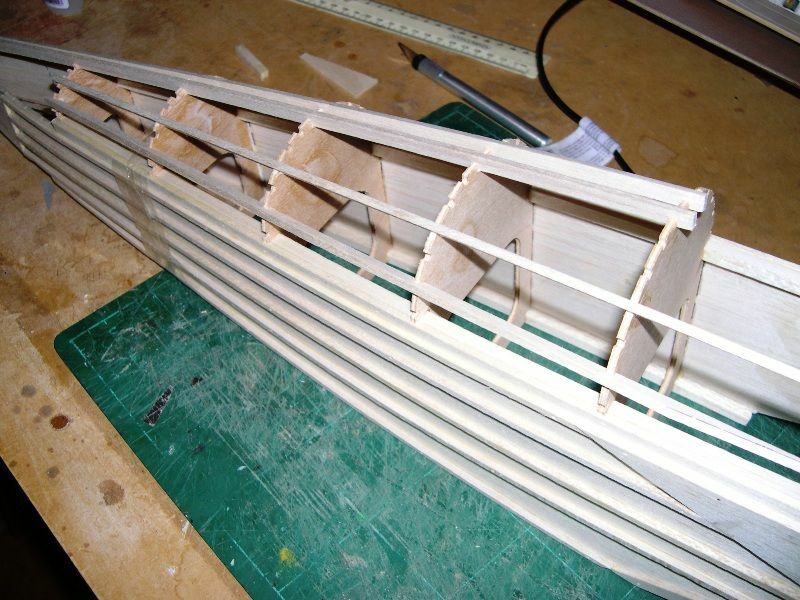 The fuselage main construction starts by gluing 6mmx6mm longerons to the inside top edges and bottom edges of the fuselage with the exception of the angled forward section to the nose. I used the formers to ensure the bottom 6x6 longeron was in the correct position. With these dry formers 3 and 4 can be assembled with the 3mm marine ply centre strut fixing plates. 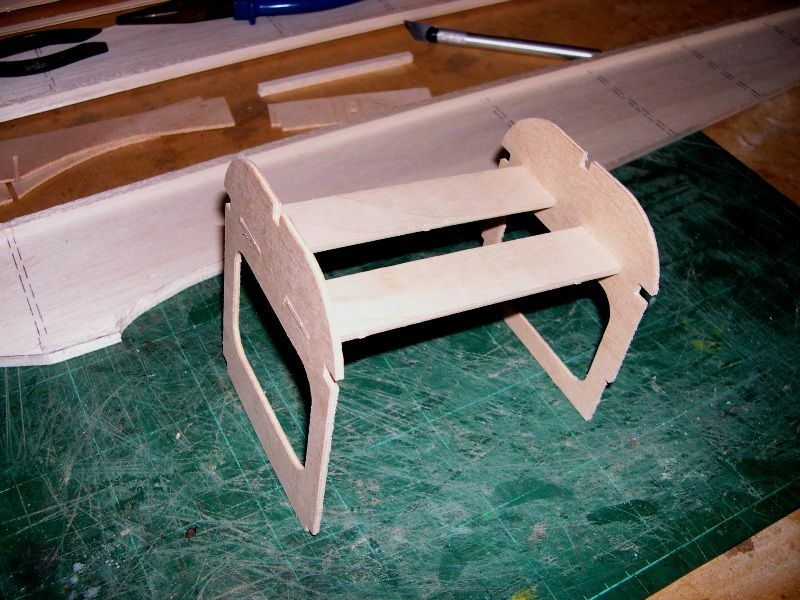 These are tongue and groove and simply slot together and check for square then glue. 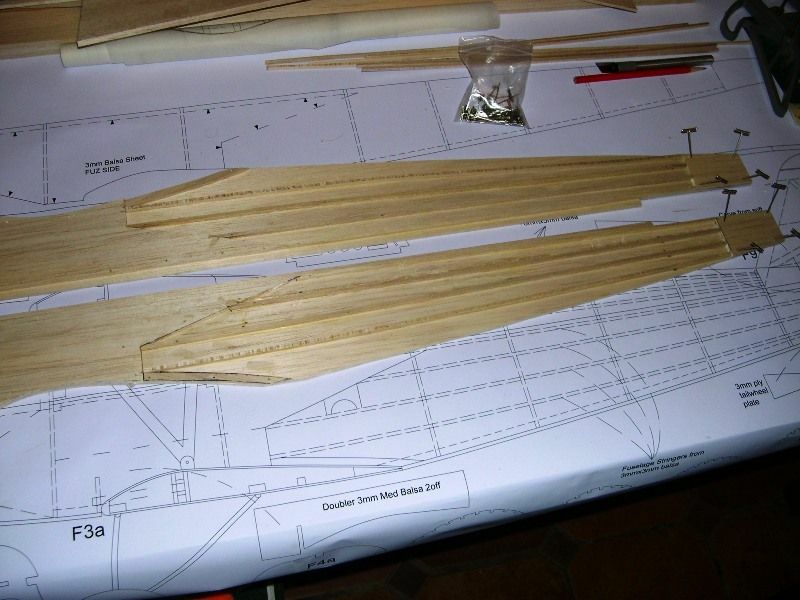 Formers 3 and 4 plus 3a (wing dowel fixing plate) can now be glued to one fuselage side. 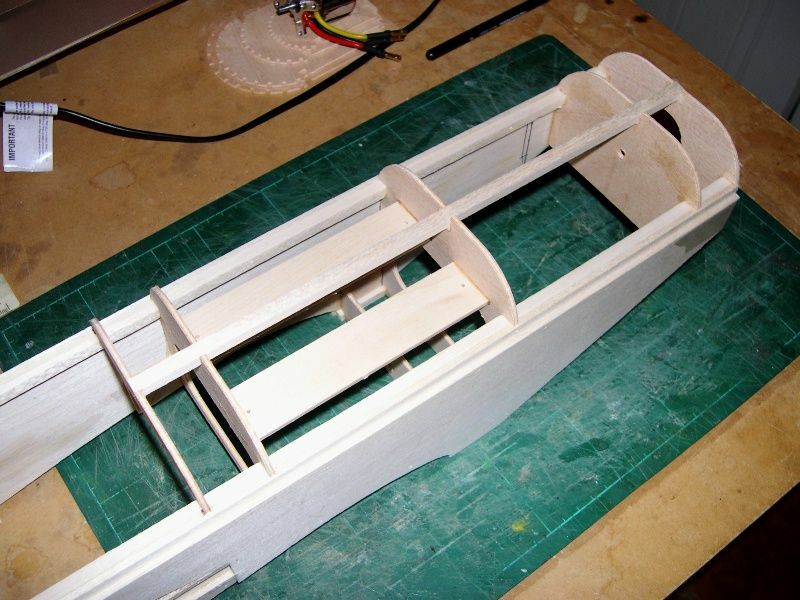 Former 6 can now also be added and then the second fuselage side can be glued into place. 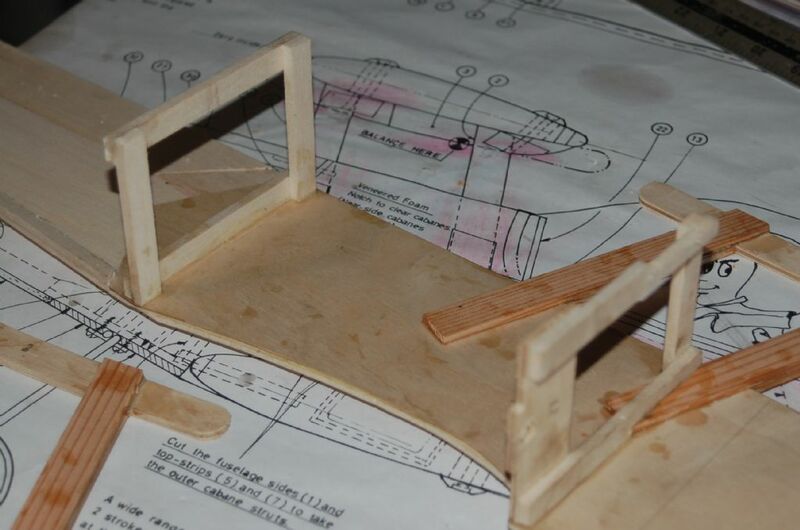 When dry former 6 (cockpit) can be glued into position. I finally made a decision to go electric (ducks to miss the flack, but I will include details for i/c mods on the plan). Chosen motor is a 600W 1100kv unit. 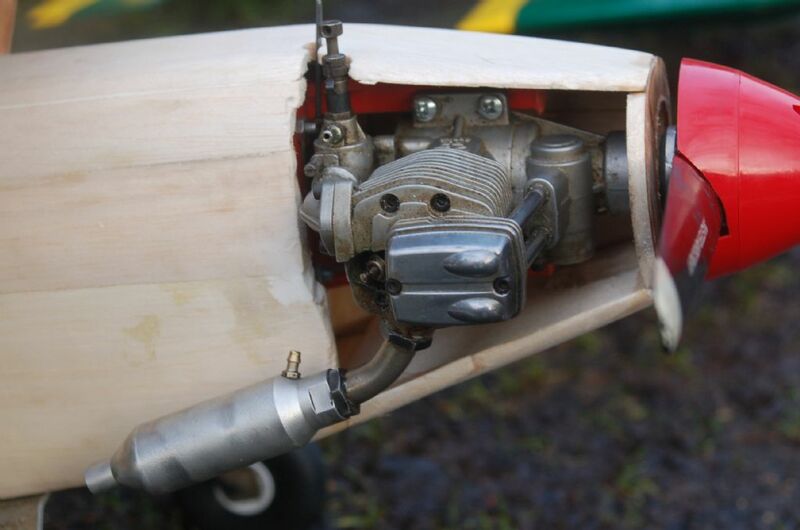 This alowed me to define the position of former 2 (engine firewall) and then glue and fix together with former 1. 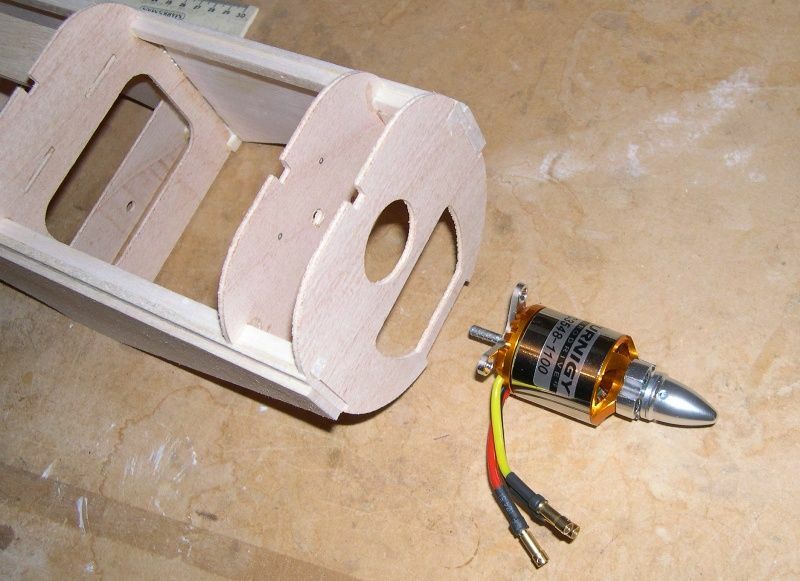 The motor will extend through F1 and the nose is made up from 4 laminates of soft balsa that I also had laser cut, but thats for later. Cheers Tim, alas I cannot take the credit for such a layout a certain Mr Boddington is probably responsible or at least his excellent book. It does make for a simple and strong structure though. Looking nice! Keep up the good work! The two formers in front of the lower wing seat is one example for me, and I would also not bother with the former half way along the chord. I would personally just have two and the bulkhead like so on the Domino. 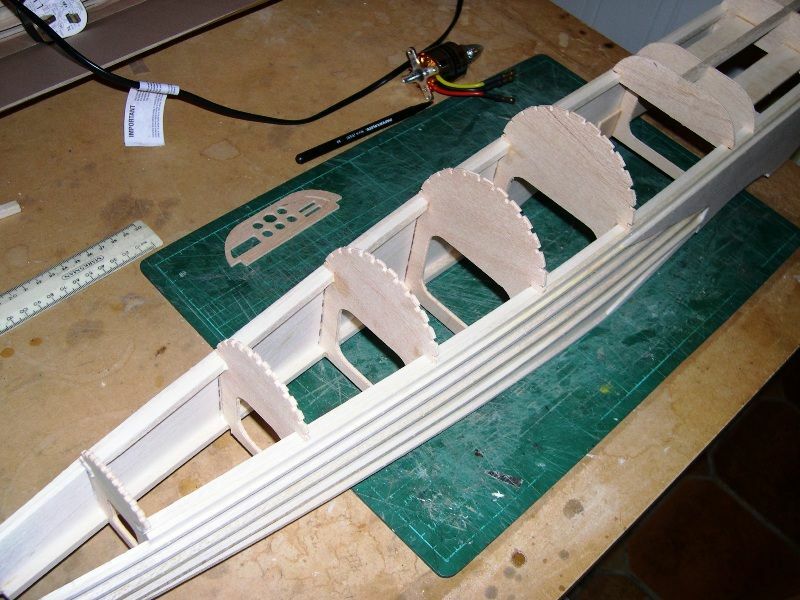 And on the top I would do something like this with different shapes for different planes, and you can plank it too for curves. But anyway, she looks great! No four stroke though? NOOOOOO! Not really that complicated cs, the two formers forward of the wing are necessary, one of course is the engine bulkhead the front one being the back plate in effect for the cowl but that will become clear later in the build. To create strength to the centre top wing struts the mid wing former is a critical stress loading feature. As with all design you have to have a degree of compromise in some areas. The good old Domino is certainly a robust airframe. Next job is the top deck centre longeron, this is from 6x6mm and allows for a centre joint for the top sheeting. 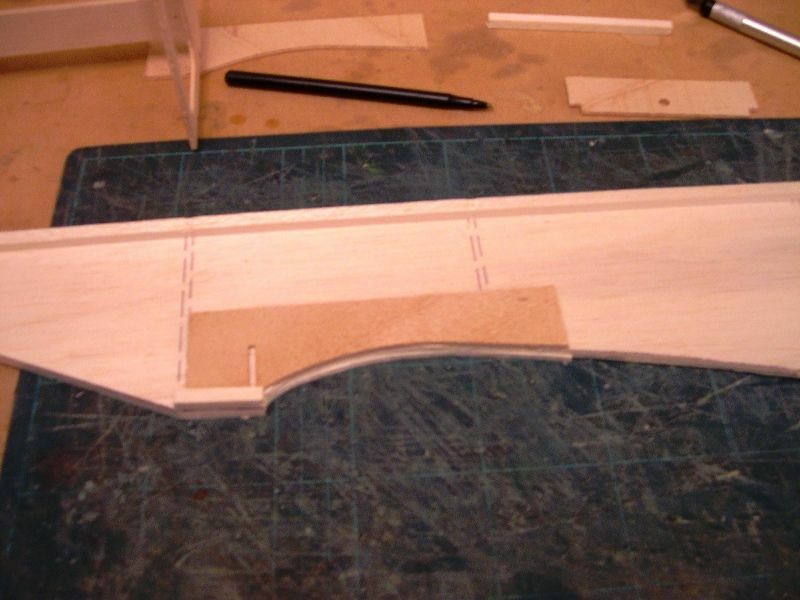 The rear stringers can now be added, these are from 6x3mm medium balsa, cut oversize and then trimed to length when dry with a razor saw. You're not hanging around with this are you Linsay? I'm sorry but it really needs a big radial cowl up front I do like the side 'stringers' though. Can't agree with Bob about the radial cowl though. 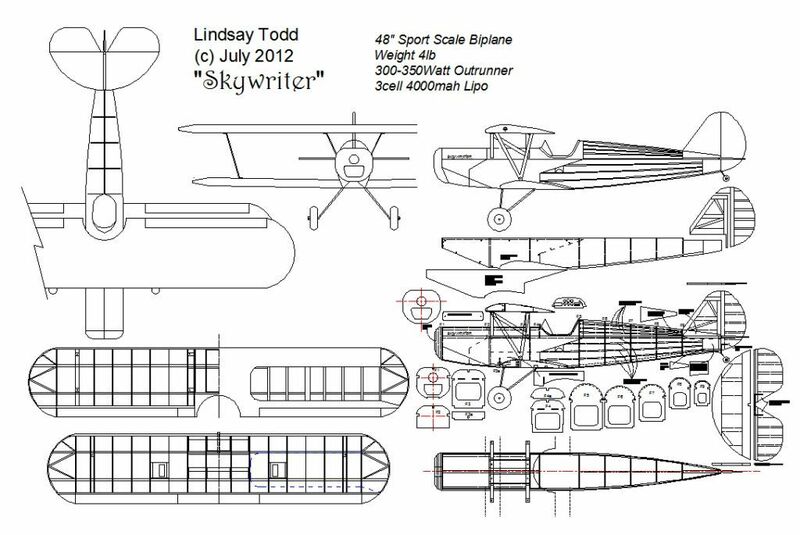 A cowl to fit that width of fuselage would look too small IMHO, but an imline or a flat-4 looks to be ideal.